Rockford’s medical school is far more than a place where future doctors prepare for their careers. It’s also an impressive center of excellence for cutting-edge research. See inside this unique program. 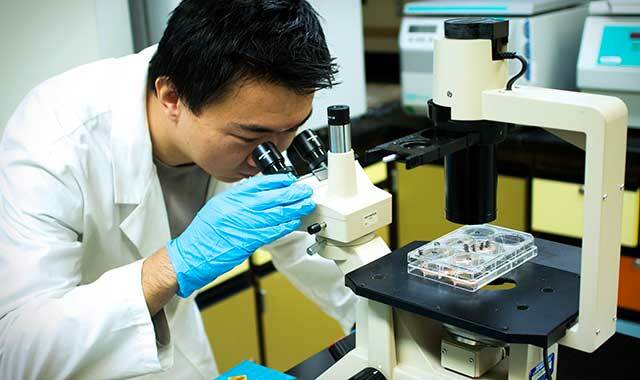 Leo Lin works in a lab at the University of Illinois College of Medicine at Rockford. Modern medical education has two purposes. First, medical students must undertake a rigorous education as they follow their passions into the medical field. At the same time, their schools sustain important research as they expand, advance and refine medicine to meet challenges presented by ever-evolving diseases. At the University of Illinois College of Medicine at Rockford, both hands-on learning and breakthrough research are essential to preparing the doctors of tomorrow. “Our faculty has pioneered cutting-edge contributions to the practice of medicine through groundbreaking research, from studies on cancer and neuroendocrinology in the department of biomedical sciences to investigations of community-based health initiatives,” says regional dean Dr. Alex Stagnaro-Green, MD, MHPE. Students at the College of Medicine have many outstanding role models and mentors. Dr. Gary Rifkin, an internal medicine specialist, points to several who are leading the way here in Rockford. Researchers at the college are discovering treatments, medicines and advanced technological applications related to Huntington’s disease, prostate cancer chemotherapy, skin cancer, molecular biology, immunology, infectious disease proteomics, and vaccines to prevent and treat microorganism diseases. Extending the reach of modern technologies, the school’s department of biomedical research has created a unique two-year graduate program focused on biotechnology, a technical aspect of biomedicine that can be applied in industrial and medical fields. Stagnaro-Green’s experience as a clinician researcher began during his own medical training. Since 1986, he has been fascinated with the impact of thyroid disease on pregnancy and the postpartum period. In 1990, he published an article in the Journal of the American Medical Association that described a doubling of the miscarriage rate in women who have thyroid antibodies. This effect has been discovered around the world and is serving as a basis for an intervention trial in the United Kingdom. Stagnaro-Green has also performed groundbreaking research in the impact of thyroid disease on pre-term delivery and the development of thyroid disease in the postpartum period. In 2011, he was the chairman of an international group that published clinical guidelines on the thyroid and pregnancy that have been adopted worldwide. He plans to continue his research and is creating a clinical practice on campus that serves pregnant women who have thyroid disorders. While the medical school remains well connected with international research, it’s also maintaining a mission of improving health within the greater Rockford area. Five years ago, the college launched its Health Policy and Social Science Research (HPSSR), a division of the Department of Family and Community Medicine (DFCM). The new department has consolidated the research activities of clinicians, researchers and faculty within the DFCM and incorporates an already existing program, the Health Systems Research (HSR). For more than 20 years, HSR has conducted applied research, evaluations, needs assessments, and feasibility studies for the college and several county, city and community-based organizations in the region. In addition, HSR provides socio-demographic and economic information to clients through its newsletter and community presentations. The new HPSSR research division builds on this established foundation as it studies important social science and health issues, both locally and nationally. Falsetti also heads the James Scholar Program, an honors elective research initiative with clinical and community-based projects. An average of 15 students each year participate in active research, beginning in their second year and extending through their third and fourth years. Currently, more than 40 students are participating in the James Scholar program. Outstanding students are encouraged to expand their intellectual curiosity, take self-direction in learning and support their pursuit of a research project in an area of interest. James Scholars must meet stringent entrance criteria, demonstrate increased academic rigor and complete a research project. In return, they enjoy privileges including a budget for project expenses, travel awards, special seminars and a partnership with a faculty research mentor. Completion is recognized upon graduation and noted in the students’ transcripts, which in turn helps them on their way to becoming doctors. Falsetti has recruited a strong faculty team to serve on the James Scholar committee. Like her colleagues, Falsetti is engaged in her own rigorous research projects for the medical college. “My area of research expertise is post-traumatic stress disorder (PTSD),” Falsetti explains. “I developed a treatment for PTSD and panic attacks and was awarded funding from the National Institute of Mental Health to test the efficacy of this treatment. The treatment was found to be very effective and is currently being tested at the Houston VA with veterans.” Falsetti serves as a consultant on that study. Falsetti developed patient and therapist manuals as part of the federal mental health grant. Additionally, she trains mental health providers through local presentations as well as national and international conferences. Beyond the global benefits of the college’s research, local medical students reap a wealth of knowledge that complements and advances their studies. While learning today’s medicine, they’re also preparing themselves to treat tomorrow’s patients. One way these students serve the community is through the Rural Medicine preceptorship, in which select students spend 16 weeks of their fourth year completing and evaluating a community-based project. Students also serve through the Community-Oriented Primary Care (COPC), a means through which primary care services are coupled with efforts to identify the unique health concerns of a particular community. After defining local needs, COPC designs health programs tailored to that community. COPC projects generally fall into one of four categories: illness or disease commonly found in rural communities; health education and wellness promotion; effective health care utilization; and environmental influences. These programs are ultimately evaluated for their effectiveness. Students’ hard work and research culminate at the annual Research Day, a 20-year tradition that highlights research projects. About 60 students chosen from the College of Medicine, College of Nursing, College of Pharmacy, Medical Biotechnology Graduate Program, Summer Medical Research Training Program and Summer Science Internship Program present their work alongside faculty and researchers from affiliated and regional institutions. Submissions are centered on basic science, clinical science, social science, public health and program activities. Each presentation is submitted for acceptance to the research committee review panel and is displayed at the Partners’ Pavilion on the Rockford campus. From rural health issues to escalating fears of evolving diseases, the need for fresh perspectives and innovation are driving the education of our future doctors. Right here in Rockford, medical students are taking those important first steps to meet today’s needs and tomorrow’s challenges. This entry was posted on Thursday, October 30th, 2014 at 11:59 am	and is filed under Health & Fitness. You can follow any responses to this entry through the RSS 2.0 feed. Both comments and pings are currently closed.